By day, Toronzo Cannon is a bus driver for the Chicago Transit Authority. By night, Cannon is an acclaimed blues artist with fans all over the world. His 2016 debut on Chicago-based Alligator Records, "The Chicago Way," is a nod to his Chicago roots. Cannon will perform as part of the Blues on the Fox festival, which will take place June 15 and 16 at RiverEdge Park, 360 N. Broadway, Aurora. Gates open at 6 p.m. At 7 p.m., blues guitarist Samantha Fish will take the stage, followed by Grammy nominated artist Elle King at 9 p.m.
Gates open at 2 p.m. for the second day of Blues on the Fox on June 16. Fourteen-year-old blues guitar prodigy Brandon “Taz” Niederauer will perform at 3 p.m., followed by Cannon at 5 p.m., slide guitarist Sonny Landreth at 7 p.m. and the legendary Aaron Neville at 9 p.m.
Tickets are $30 each per day. Children 12 and younger are admitted free to Blues on the Fox, but must be accompanied by an adult 18 or older. For tickets and information, visit RiverEdgeAurora.com, call the RiverEdge box office at 630-896-6666, or stop by in person at RiverEdge's satellite box office, the Paramount Theatre, 23 E. Galena Blvd., Aurora, from 10 a.m. to 6 p.m., Mondays through Saturdays. I had the chance to talk to Cannon about the upcoming show. Q – Of course, you are going to be playing at Blues on the Fox. This will be your first time at Blues on the Fox, right? It is, yes. I can't wait to do it. I've heard of it, I just never thought I would be playing in it, you know what I mean. I always thought I would be booking myself. But then when I got with Alligator Records, things started opening up. Q – That's true. The spotlight's really been on you in the past few years, maybe because you've got an interesting back story, the fact that you're a bus driver and a musician. Are you surprised that so many people want to know more about you? Yeah. I've always tried to just kind of separate the two. My music is my outlet and my bus driving job is to sustain a living, with benefits and the whole thing, making money for the family. And all of a sudden, it became a story, like Chicago blues man drives a Chicago bus, you know, that kind of thing. Q – Do you ever see a time where you give up being a bus driver? No, I'm too close to retirement right now. I don't want to live a lie or a dream where it's like, oh, this is going to sustain me and my family for the rest of my life. There's no health benefits in the blues. I've been driving a bus for 25 years. And I'd never thought I'd do music on this scale, actually. I just figured it would be a nice little second income. I just thought it would be cool to have people enjoying my music. I drive in some of the worst neighborhoods in Chicago. And I see things, and I'm talked to in a certain way. Q – I guess it kind of keeps it real. You are not living the music star life. I think so. I get up at 3:30 a.m., and I get off in the late afternoon. So we're talking 16 hour days. And I still have to write music. You need to do what you need to do in order to do what you want to do. I don't do it for any extra pats on the back, like I'm doing something sensational. It's just that's how much I want to play this music. Q – Being a bus driver probably provides you with a lot of inspiration for songwriting, right? Actually, the song "Pain Around Me," which is on my Alligator debut "The Chicago Way," is kind of like a tune I wrote directly on one of my routes. Most of my songs I created while I was working. I work 10 hours a day and I carry a little pad of paper with me in my pocket and if I see something or if I feel something, I write it down and try to elaborate on it later at home, put some music to it. Q – Besides providing fodder for your songs, what do you like about being a bus driver? It pays the bills. It's a job that you can raise a family on. It's a real job, it's a career. Any job that you do for an extended period of time is a career. Q – I understand you bought your first guitar at age 22. What drew you to the blues in the first place? Well, I'm a child of the '70s and '80s. I grew up around the blues. My grandparents raised me. I joined a reggae band and I played with them for a couple of years. And then I started going around to jams. Everywhere in Chicago, you had blues jams. When I would go these jams, I would hear songs that were played in my house when I was a kid. It was a full circle moment. The one famous club that was close to my house as a kid was called Theresa's Lounge. I was too young to go there, I was like 10 years old, but my uncles used to go there. I grew up around it, but I didn't know it was blues music until I got older. Q – I know that from 1996 to 2002, you were a sideman to musicians like Tommy McCracken, Wayne Baker Brooks and Joanna Connor. What did you learn from them? I learned about stage presence and and how to run a show. I started older, so I didn't come in with this intention of, "I'm going to be a star." I came in with a work ethic of this is this person's gig, and I'm going to treat it with respect. I'm going to learn the music, I'm going to show up on time and I'm going to dress appropriately. I think that's what got me jobs, because I took it seriously. When I got on stage, I had fun, but I took their music seriously and their direction seriously, with no push back or talking back to the band leader. I think that by me coming into this music when I was older, it gave me a different perspective of it. I wasn't 15 or 16 years old saying I was going to be a blues star. I was working a regular job, and playing blues was my side hustle. Kind of how it was originally. Muddy Waters and all those guys had jobs, they were driving trucks and forklifts and all that stuff, and the music was like a side hustle for them. 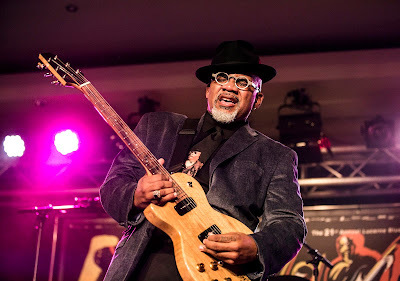 Q – Your star started rising when you took the stage at Chicago Blues Fest in 2015 as a headliner. How did you feel stepping on to that stage and playing in front of all those people? That was cool. It was great man, just to see that many people. And they are hanging on my every word. It was pretty cool, man. It was humbling. I'm always humbled that people remember my songs. I'm like, wow, I thought up that song on the bus. It's very cool, you know.